Sorry for the delay in posting a new article. Health issues have intervened but I am now back on track…for the moment. My on-line course with Udemy.com is attracting students. In fact, we are about to launch “Level II”. It will be an on-line tutorial of one painting from start to finish. The drying time has been removed but the basic critical steps are recorded. While it is not productive to record every step we have sought to preserve the key moments. As I have stated before everyone is unique and we approach our work in different ways. No one can truly be anything other than themselves. While we may admire the work of others and often be inspired; at the end of the day we need to find our own way of working. There is no question that we can gain valuable insight in process from observing the works of others. However, the bigger question is to what purpose do we observe and absorb? Various writers have elaborated upon these two words noting the intertwined relationship between them. Consider it simply as a part of developing a painting or completing any task. Perhaps you would prefer to call it putting ideas into action. All successful art has a concept. It may be the play of light upon a given object or the interplay of a selected color range. Once the art concept is conceived, if it is to be realized, then comes the necessity or process of developing it. This is one of the reasons I always encourage my students to develop sketches with loose color studies. The ones that follow the advice have a greater success ratio than the ones who don’t. Why do they have a better success ratio? I think it is because sketches help get the process started. Putting marks on paper begins the cycle that brings us forward in the march to realize our goal. This previous statement is only valid provided the person making the marks has some idea regarding design, color harmony, etc. I interject this because regrettably we have too many voices today espousing “do your own thing” without any regard for basic fundamentals. I have lived with this subject of this painting for 23 years. 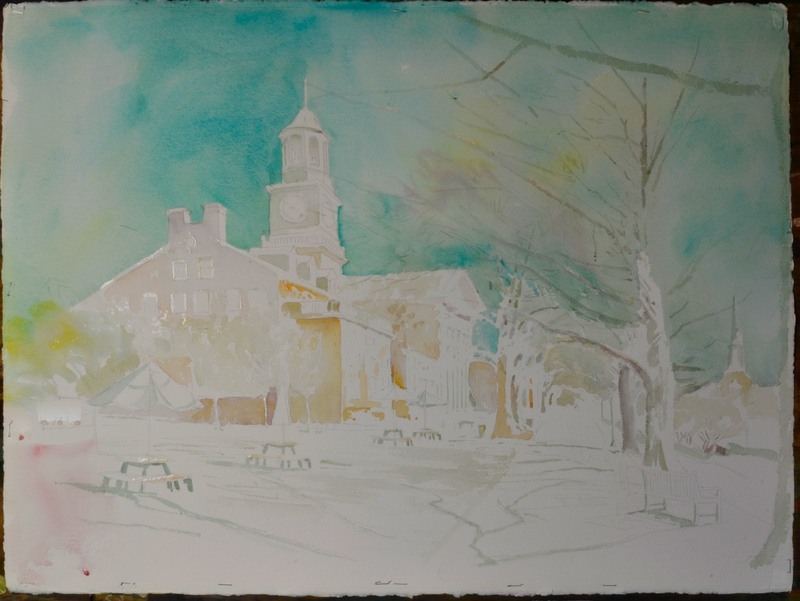 I have lectured, sketched and done quick watercolor demos for students on this site in all sorts of weather. While teaching, my focus has been on teaching my students; leaving little time for a deeper personal on site exploration of the subject. 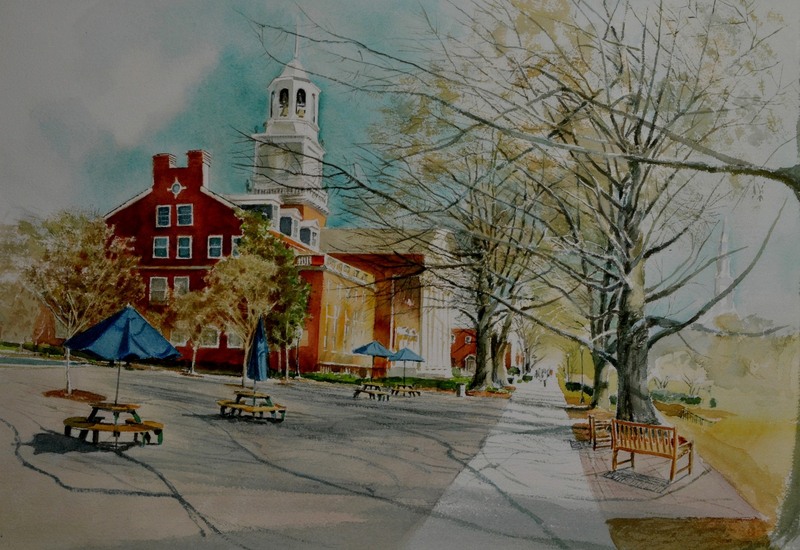 There have been a few quick watercolors of various spots and numerous plein aire demos in relation to class. Now I am gaining the time to really develop some serious pieces. Why name it The Tunnel? Great question. The open space is a gathering spot on campus named Ben Brown Plaza. It is a popular gathering spot for students and makes a logical location for various events. The large building is the Harwell G. Davis Library with a slight hint of Reid Chapel off in the distance. The beautiful oaks form a canopy along the sidewalk with wonderful shadows and playful light hitting the ground as well as the people and the buildings. In this piece the tunnel is not fully realized but come spring and full summer and it will be a different mater. I have work on progress that depicts that tunnel effect more strongly. However, for most of the students if you mention the tunnel they know what you mean. Hence, the title. This is the foundation. Take note of the various colors and their position as well as relationship to one another. As the work progresses these colors will play a stronger role in the painting. Do note that some of the passages were executed in a wet ‘n wet technique while the washes with sharper defined edges were painted directly on dry paper. All of these techniques can be used in glazing. I have left the edges of the paper showing so you can see the staple marks. This is how I mount my paper to a 3/4″ marine plywood board to prevent the paper from rippling. Yes, unfortunately even 300 lb. paper will buckle these days. My plywood boards are quite old and I sealed them with marine grade varnish over 30 years ago. Some prefer to use gator board and that is fine. I see no need to toss out something that still works for me. The colors I used were Andrews Turquoise by American Journey, Winsor & Newton Permanent Magenta, M. Graham Gamboge, Holbein Leaf Green, 300 lb. D’Arches cold press watercolor paper full sheet,and a 2 inch showcard sable flat brush, with assorted Winsor & Newton Series 7 rounds. The final piece. Very little activity on this day. It was very cold and few people were stirring. Other pieces will probably have more people. Watch and learn about watercolor glazing techniques from Don Rankin. This is a perfect companion to the book.